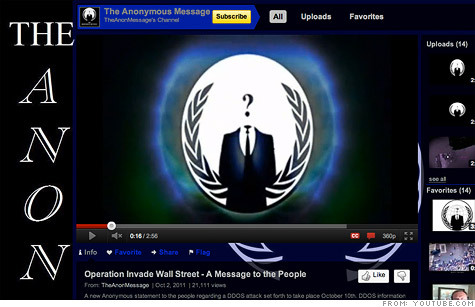 A YouTube video called for an Anonymous attack on NYSE.com. NEW YORK (CNNMoney) -- Anonymous' call for a massive attack on the New York Stock Exchange's website was met Monday -- but very, very briefly. The website was slow and then unavailable from about 3:35 p.m. to around 3:37 p.m, after which it returned to normal. Keynote, a mobile and Internet monitoring company, confirmed that NYSE.com slowed down during that time. It also measured widespread disruptions to the site between 5:30 p.m. and 5:55 p.m.
Another tracking site, AlertSite, measured "a definite increase in response times from 3:45 p.m. to 4 p.m. ET." After that, the site returned to normal. Monitoring site downforeveryoneorjustme.com also registered a series of brief outages. But Rich Adamonis, a spokesman from the NYSE, rebutted the monitoring sites' findings. "We detected no service outage on our corporate website at that time," he said. In a message that went out in early October through a video on YouTube, the group called for a "distributed denial of service" (DDoS) attack, which directs a flood of traffic to a website and temporarily crashes it by overwhelming its servers. It doesn't actually involve any hacking or security breaches, and would have no effect on NYSE's stock-trading systems. Adamonis confirmed that trading was not impacted. DDoS is a tool that Anonymous has employed successfully before, taking down MasterCard.com and Visa.com for several hours on Dec. 8, 2010. The YouTube video posted earlier calling for the NYSE.com attack proclaimed: "A new civil rights movement has begun. You now have an opportunity to make a difference. Join the protests. Organize your own. Watch online. Be a part of the movement." Anonymous' attacks haven't always worked: It failed in an attempt to take down Amazon.com (AMZN, Fortune 500), which has extensive safeguards against sudden traffic spikes. The DDoS attacks have also led to the arrests of several participants. At least a few people claiming to be part of Anonymous didn't think the attack on NYSE.com was a risk worth taking. One site used to coordinate Anonymous operations, AnonNews.org, posted a statement saying that it was "sincerely worried" about the plan, due to the bad press it could give to the Occupy Wall Street movement. A back-and-forth debate raged across Twitter Monday afternoon, with various factions of Anonymous alternately cheering and decrying the planned attack. But in the end, the chatter drew more attention than the actual effects of the cyberprotest. NYSE.com barely blipped, and the markets finished the day with a rally: The Dow Jones industrial average finished Monday up nearly 3%. -- CNNMoney staff reporter Laurie Segall contributed reporting to this article. What's a Denial of Service Attack?